It’s a warm, humid morning in Charleston and the call of seagulls has finally replaced the sound of bulldozers and blowtorches. In just over nine months, architects and construction workers erected a building that is more than just a pretty face. The state-of-the-art 75,000-square-foot facility, an iconic glass and metal structure located on the waterfront of Charleston’s old naval base, will symbolize the joint vision of Clemson University and businesswoman/philanthropist Anita Zucker. The program will serve as the academic anchor in the Clemson University Restoration Institute (CURI) applied technology park, joining the Warren Lasch Conservation Center and the SCE&G Energy Innovation Center. The Zucker Family Graduate Education Center will offer master’s programs in electrical engineering, systems engineering and digital production arts (DPA) and a Ph.D. program in computer science. “For years our business community has complained that we don’t have enough graduate-level courses in engineering. Well, I feel like that call will finally be answered with this new center,” Zucker said. The idea is that the engineering programs will help keep young talent and expertise from leaving South Carolina for other places that offer opportunities to grow in the industry. Additionally, the DPA program will expand instruction in video game design and content development in hopes of creating a new regional industry. The center will start with a combination of on-site and remote (via video conference) learning with a plan to have the program completely local within three years. The timing of the opening is ideal as Charleston is quickly becoming one of the nation’s fastest-growing areas for such advanced business and industry sectors as aerospace, transportation, advanced materials, advanced security and biomedical services and manufacturing. According to the Charleston Metro Chamber of Commerce, the Charleston region is one of the fastest-growing metro areas in the United States, and growth in population and employment is expected to continue to exceed the national average. But the Zucker center isn’t the only new building for Clemson in Charleston — new to Clemson, that is. In August, the Clemson Architecture Center in Charleston and the Historic Preservation Program were united under one roof when they moved into the Cigar Factory on East Bay Street. The former cigar and textile manufacturing plant was originally built in 1881 and is on the National Register of Historic Places. Formerly, the two programs were housed in three separate locations. To better meet existing needs, anticipate planned growth and ensure that Clemson students in Charleston have all the resources they need, a larger, more functional facility was required. Though completely different aesthetically, the hope is that both these buildings will expand the footprint of Clemson in South Carolina and in turn cement the idea that the University is committed to providing opportunities to students, teachers and industry alike, across the entire state. 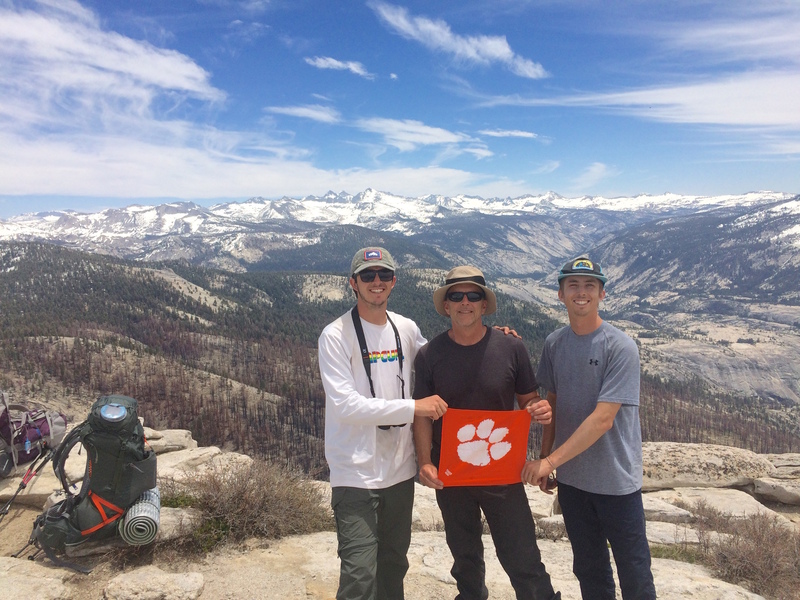 California: Robert Duvall ’84 and sons Jacob and James spent five days hiking in Yosemite National Park. This spring, alumni and their daughters came to campus for Bring Your Daughter to Clemson, an opportunity for parents to share their love of the University with their daughters. Girls ages 6-18 toured campus, learned about majors and student activities, met students and professors, and got a small taste of what it means to be a Clemson Tiger. More than 200 participated in the weekend event sponsored by the Women’s Alumni Council. For Christine Tedesco art and life all bleed into one. Art is life. Life is art. Nothing is an imitation. Each building she’s designed as an architect with a team is just as much a piece of her as a quilt she’s created alone for the couch at home. Her creative pursuits led to a “Best in Show” at the Anderson Arts Center 41st Juried Arts Show this past spring for a quilt named “Beige #1.” It was one of more than 500 entries in the show. She’s also shown pieces at the Mint Museum in Charlotte, N.C., the Ogden Museum in New Orleans and Art Fields in Lake City. “I think the first thing I made was an apron,” said Tedesco. She began sewing when she was age nine, and as she grew, the instructions from her mother grew from stitches to life lessons on careers. “My mother was very adamant that I had to major in something I could do so I didn’t have to depend on a man,” said Tedesco. 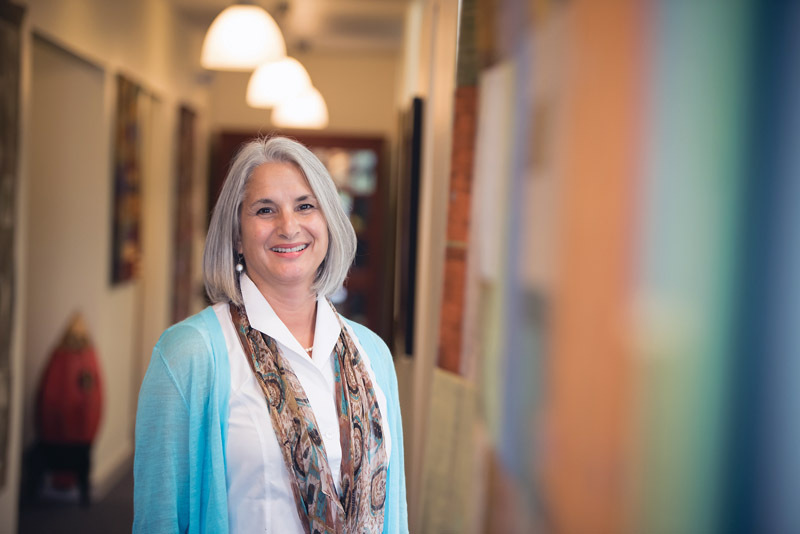 Her love of making things led to a career as an architect, where she now leads at RSCT architecture + design. But she didn’t leave behind her personal creative time just because she was being artistic at her day job. Instead she wanted to challenge herself to be innovative. At age 29 she took sewing to the next level and began quilting. “I wanted to try something more difficult,” she said. She also took a tailoring class and tackled making a man’s suit. In “Beige #1,” the piece wasn’t about color at all, but instead about the relationships of the seams and how they intersect. “I just started mapping lines and free form — it’s a lot less color,” she said. Tedesco said she tries to be disciplined about her work. Each piece takes about 40 to 80 hours. A bedroom in her Pendleton home serves as a studio. Unlike her work office, which has clean lines and barely a trace of a paper trail from the day’s work, her studio showcases years of ideas. Quilting books stacked about 4-feet tall stand by the door. Scraps of a current orange, beige and black piece are pinned tall and high on the wall. Outstanding faculty members were honored, and the president cited achievements driving Clemson to new heights in the world of academics. Executive Vice President for Academic Affairs and Provost Bob Jones presented awards of achievement to four outstanding faculty and staff members: Chris Heavner, Bruce Martin, Thomas Britt, and Michael Sehorn. Psychology professor Thomas Britt received the Alumni Award for Outstanding Achievement in Research, given by the Alumni Association and the Provost’s Office to tenured or tenure-track faculty members who have conducted research in residence for at least five years. The award was presented in May at the final faculty meeting of the academic year. Learn more about Britt at clemson.edu. It seems that no matter where you go in the world, from Timbuktu to Turbeville, you meet someone with a Clemson connection. Tigers are spread far and wide, and if you wear something with a Tiger Paw, they’re sure to comment on it. Each spring, one Clemson student is chosen as the recipient of the Norris Medal, the highest honor for an undergraduate. Established in the will of Clemson trustee D.K. Norris, the honor is awarded to the graduating senior judged the best all-around student by the Scholarships and Awards Committee. This spring, that student was Austin Herbst of Easley, who graduated with a dual degree in biochemistry and genetics, with a double minor in microbiology and psychology. Two weeks before graduation, he took home multiple awards from the College of Agriculture, Forestry and Life Sciences, including being named the outstanding senior in genetics and biochemistry and receiving the Martin Award, which honors the student in the life sciences with the highest GPA. The Blue Key Academic and Leadership Award and the Phi Kappa Phi Certificate of Merit rounded out the list. The Blue Key award is given to one senior in each of Clemson’s seven colleges to honor outstanding scholarship, campus leadership and service. Last spring as a junior Herbst was awarded the prestigious Goldwater Scholarship for excellence in science, mathematics and engineering. 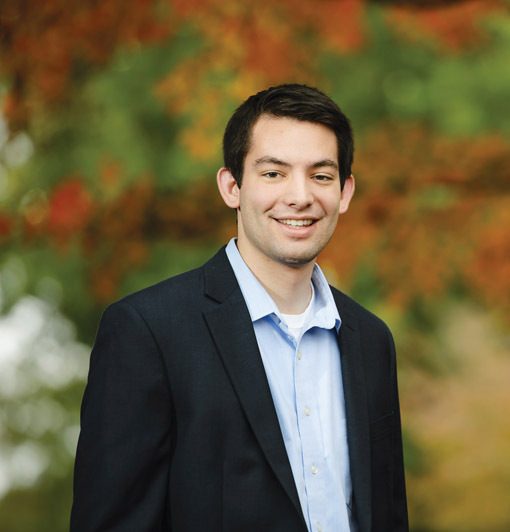 He was involved in undergraduate bioengineering research during his first three years at Clemson, and conducted research at both Furman and Emory universities. He published five peer-reviewed articles. He has volunteered in the Dominican Republic, Honduras and Nicaragua, and was active in Engineers without Borders, Engineering World Health and Omicron Delta Kappa Honor Society, of which he was president. Having been admitted to medical school at Harvard, Johns Hopkins and Vanderbilt, Herbst is planning to attend Harvard this fall. He would like to pursue a career in global health and work internationally. 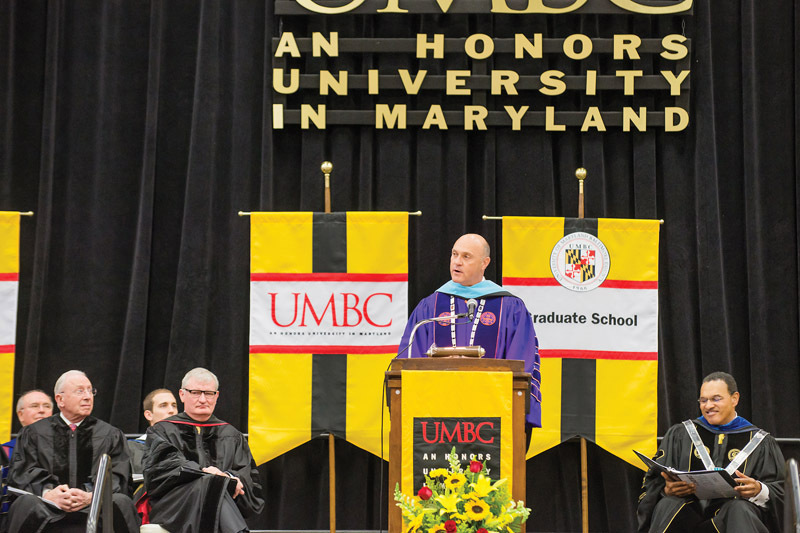 President Clements may be a three-time alumnus of University of Maryland – Baltimore County (UMBC), but he can now add a fourth degree to his resume. In May, he and Harvard University President Drew Gilpin Faust received honorary degrees from the institution during the spring commencement ceremonies. He is pictured here with UMBC president Freeman Hrabowski III. UMBC is a member of the University of Maryland system and is a public research university with an enrollment of approximately 14,000 graduate and undergraduate students. Clements, who earned a bachelor’s degree in computer science in 1985 and M.S. and Ph.D. degrees in operations analysis in 1991 and 1993, respectively, received an honorary doctorate of education and spoke at the graduate school commencement ceremony. Faust spoke at the undergraduate commencement ceremony and received an honorary doctorate of public service. Over 100 alumni and 30 employers participated in the Alumni Association’s first Alumni Career Fair in May. The event, held at CU-ICAR’s TD Gallery in Greenville, offered alumni the opportunity to explore career options with area employers as well as network with other alumni. This career fair was sponsored by Alumni Career Services, which was launched based on feedback from previous alumni surveys. There are plans to expand with events in areas where there are large numbers of alumni, and eventually to offer events through clubs across the county. If your company is interested in participating in an Alumni Career Fair, contact Deborah Cremer at dcremer@clemson.edu. 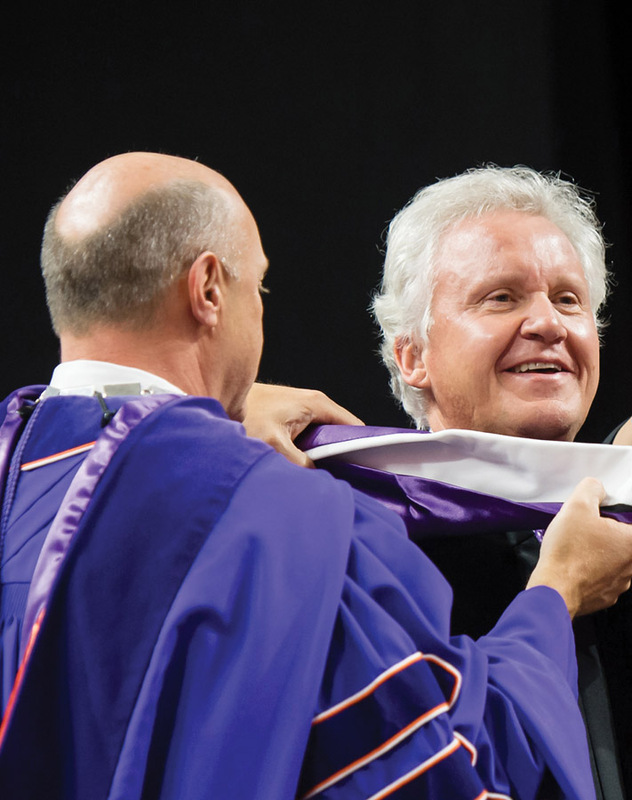 University officials bestowed an honorary doctorate of humanities on General Electric Chief Executive Officer Jeffrey R. Immelt at the commencement ceremonies in May. Immelt, who spoke at the ceremony, was honored for his continued partnership with Clemson as well as his devotion to excellence in business and to improving the lives of citizens around the globe. The ninth chair of GE, a post he’s held since Sept. 7, 2001, Immelt became an officer of GE in 1989 and joined the GE Capital board in 1997. He was chair of President Obama’s Council on Jobs and Competitiveness and is a member of the American Academy of Arts and Sciences. Under Immelt’s leadership, GE has been named by Fortune magazine as “America’s Most Admired Company,” and he has repeatedly been named one of the “World’s Best CEOs” by American financial magazine Barron’s. General Electric has generously and consistently supported education, technology and health care initiatives around the globe. Under Immelt’s leadership, GE has been a key partner with Clemson in the study of innovative technology and workforce development — on campus and in the innovation campuses across the state.